This term I am teaching the Papercraft Sampler to 9-13 year olds. I had several lessons planned for our 10 week session together, but once we started making paper lanterns, they didn't want to stop! Our lanterns were based on an up-pop design I've used before. 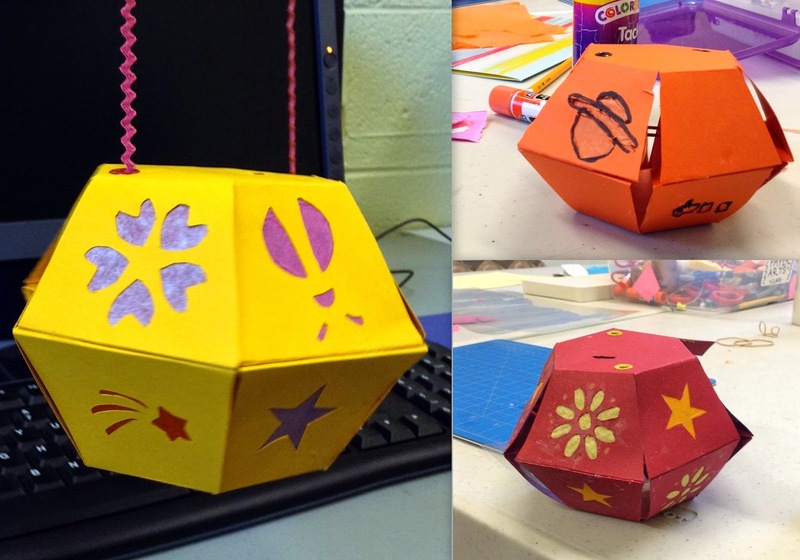 This 14 sided lantern, can pop-up, or fold flat with the assistance of a rubber band and a paper hook mechanism. We cut out various shapes on the facets and backed them with tissue paper for a colorful glow. As we started cutting out our stars, moons, flowers and various designs, I think the kids became fascinated with the light and how their pictures lit up. I brought in a light table to test out designs before we fully assembled the lanterns. We used battery operated tea lights. We can use sharp knives and hot glue guns, but I draw the line at open flames in the classroom! 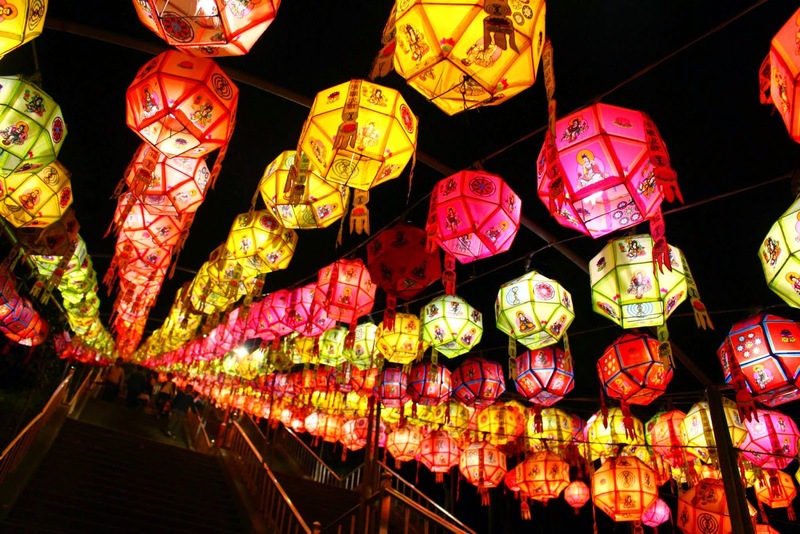 We got inspiration from the lantern festival in South Korea where my friend David lives. 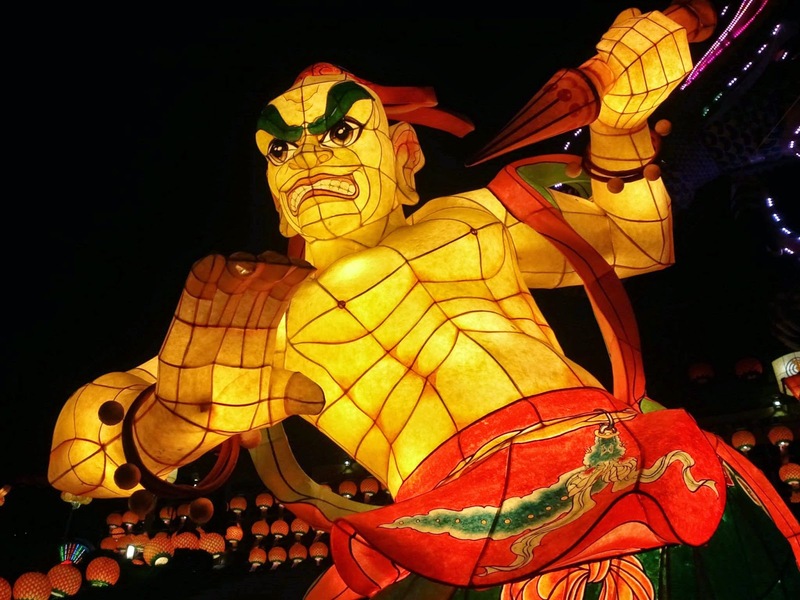 His friend Gun-Sang took pictures of lanterns all over the city. We were able to look at his photo gallery online and make comments about our favorites. We sent him a few of our pictures to show to his students there! We did find some structural challenges when the stencils were large enough to effect the integrity of the shape as a whole. In hindsight, we could have considered either smaller designs, thicker paper, or reinforcements in the frame of the lanterns. Or, if we decided that they didn't need to flatten, perhaps we could have used a wire cage underneath. I love this intricate tree design, but it does need structural support. A wire frame? A few of our finished products. If you want to see more of our process visit my Paper Lanterns album.